Come play Bingo with American Sign Language vocabulary! This event is back and a perfect break from midterms. You do not have to know any ASL to come. This event is brought to you by the Intro to Deaf Culture and ASL ExCo, Disability Resources, and Obility. 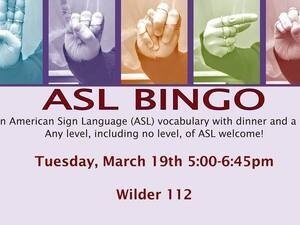 The photo is of the poster for the ASL bingo event. The images on the poster are five pictures of the same hand fingerspelling "BINGO" with each photo tinted a different color, conveying playfulness. The text reads: "ASL BINGO. Learn American Sign Language (ASL) vocabulary with dinner and a game! Any level, including no level, of ASL welcome! Tuesday, March 19th 5:00-6:45pm. Wilder 112. Brought to you by the Intro to Deaf Culture & ASL ExCo, Disability Resources, and Obility.